As Turks prepare to head to the polls Sunday in a snap election called by incumbent President Recep Tayyip Erdogan, Foreign Policy has published what is essentially a summary blueprint outlining the ways Erdogan could steal the election, noting "Sunday's vote is one he can't afford to lose." As we previously commented, though the man who has dominated the nation's politics for almost two decades is not expected to lose, a consensus is emerging that the vote should be regarded as a referendum on his person and leadership. And now, a visible surge in popularity for the rival secularist Republican People's Party (CHP) candidate has pundits declaring the opposition actually has a chance. The president moved elections that weren't supposed to be held until 2019 forward by more than a year in hopes of smashing an unprepared opposition, but there's yet a possibility this could backfire. Ironically, the move could blow up in Erdogan's face as he called for the early elections at a moment when the economy appeared strong, but which in the interim began tanking — giving all but die-hard AKP supporters reason for serious pause as the opposition's message becomes louder. His legacy has already been established as ushering in Turkey’s transformation from a parliamentary to a presidential system, giving a disproportionate share of power to the president, and should he win he'll assume even greater executive powers after last year's referendum which narrowly approved major constitutional changes related to the presidency. 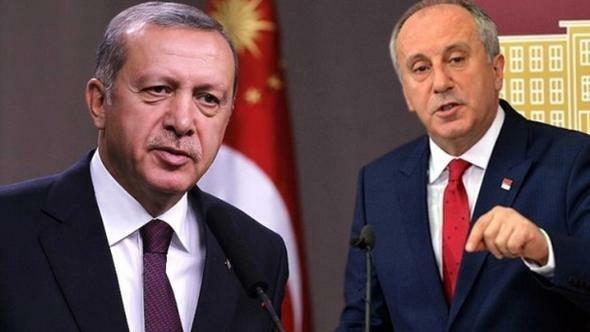 But Erdogan's main opposition candidate, Muharrem Ince, is this week drawing immense crowds according to a variety of reports, and gaining support from a cross-section of Turks increasingly fed up with Erdogan's power-grabbing. Ince, a former high school physics teacher widely seen has having much more charisma, has mirrored Erdogan's firebrand and combative rhetoric while taking direct aim at the Islamic conservative Justice and Development Party (AKP) leader's enabling corruption and nepotism, and his further overseeing an economy in tailspin with the lira having lost nearly 20% of its value since the year began, inflation at 12%, and interest rates at 18%. Muharrem Ince's simple yet pointed appeal goes something like this: "Erdogan is tired, he has no joy and he is arrogant," he told hundreds of thousands of supporters at an Izmir rally on Wednesday. CNN noted the rally presented "what looked like the largest crowd in the elections period yet." 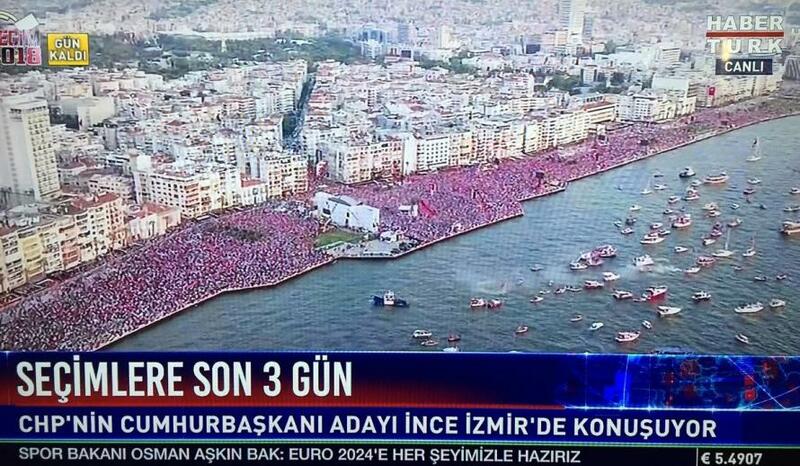 Muharrem Ince's Wednesday rally in Izmir as shown on Turkish television. Crowd size estimates ranged from 250,000 up to millions, depending on who was commenting. Sunday's election is being widely described the most important in recent Turkish political history — a crossing the Rubicon moment for Erdogan as he stands to inherit an unprecedented and likely irreversible level of sweeping executive authority. Suppressing the Kurdish vote is critical for the government... one can expect more shenanigans in Kurdish-majority areas, because Erdogan needs to push the Peoples’ Democratic Party below the 10 percent threshold to ensure that his party wins a majority of seats in parliament. ...The national press, meanwhile, is completely dominated by Erdogan’s acolytes. The results are unsurprising: In the last two weeks of May, a study demonstrated that the president and his party received far more coverage on three government-owned television stations, including a Kurdish-language one. ...Still, it is quite doubtful that he will allow anything but a total victory for himself — one should expect a great deal of shenanigans on the part of the ruling party in the final run-up to the June 24 vote.